Cutting Optimization Pro can be used for cutting rectangular sheets made of glass, wood, metal, plastic, or any other material used by industrial applications. Cutting Optimization Pro can also be used as cutting software for linear pieces such as bars, pipes, tubes, steel bars, metal profiles, extrusions, tubes, lineal wood boards, etc and other materials. Installer - it will create a shortcut in Programs folder and on Desktop. Requires administrator rights to install. Download the installer from here:cutting.exe (1.6 MB) or cutting.zip (1.6 MB). Run it and follow the steps shown on screen. Without installer - no admin rights required. Download the program from here:cut.exe (6.1 MB) or cut.zip (2.1 MB). You may save it directly on Desktop. Run it. There is no installation kit. Please remember where you saved it so that you can run it next time. If you don't know what to choose, please download the installer. 1D and 2D optimization in the same cutting program - you may use the program for both 2D and 1D optimization. Multi-stage guillotine - all cuts in a stage are perpendicular to the cuts on the previous stage. The user may specify the number of stages and the direction of cuts for the first stage. Any number of pieces in the INVENTORY and DEMAND - virtually no limit for the number of pieces that you want to optimize. Any measurement metric- The way in which you introduce the data is a general one. You don't have to specify a metric. Just choose a metric in your mind and enter all data using that metric only. Fractional input. Pieces can be introduced either as 100.5 or 100 1/2. More info about fractional input can be read here. Adjustable cutting blade thickness- For glass cutting with diamond the cutting blade thickness is 0, but for wood, metal handling you need a saw with a greater thickness. Adjustable optimization level- One may specify how many layouts to be generated before the solution is outputted. If you don't have too much time and you don't have a good computer you may set the Optimization Level to a low level. This feature helps you to run your program on any kind of computer (from 486 to the best processors available today). Maximal cut length limit - You may specify how long a cut can be. This is useful when you perform the cuttings manually. Adjustable useful waste - all wastes smaller than this size are garbage (will not be added to repository). Adjustable limit for breakable parts - No waste will have a size lower than this parameter and no 2 parallel cuts will be closer than this. It is used in order to avoid the breaking of too small material. Useful in glass industry. Reduces panel waste and costs - using the latest achievements in the field of Artificial Intelligence to reduce the waste. Grain direction control - useful for wood cutting optimisation. A parameter let the user to specify if the piece can be rotated or it should be kept fixed. Automatic offcuts handling - the useful waste is automatically added to the Inventory of materials. Vertical printing of the labels and edge bands - this will optimise and simplify your layout. Graphical display black-white or colourful images and text mode of the obtained results - the results are displayed as images (black and white or colourful) or as text-tables. Save images automatically - all the obtained 2D sheets can be saved as jpeg images with 1 click. The programs automatically appends a number to an image. Copy-paste from Excel. Just select some columns from Excel and paste them in Demand or Inventory grids. Grouping similar layouts - this will reduce the number of printed sheets of paper. The number of repetitions for each sheet will be displayed. Sketchup exporter - We offer a free plugin for Sketchup which helps exporting the size of components from a Sketchup model to a file loaded by Cutting Optimization pro. Read more: here. Magnifying a sheet. This is useful if you have a long roll which you can visualize it by magnifying it. Printing the obtained layouts - on any printer. Printing multiple layouts on the same page - You may print 1, 2, 4 or 6 layouts on the same sheet of paper. Printing the REPOSITORY and the DEMAND of the customer - you may print the pieces that you want to optimize. The cuts are shown in text format in order to use them with a CNC machine. Edge banding handling - the quantity and the type of material attached to the edges of the wood sheets is manipulated by the program. Computes / Prints the total cutting length. Displays diagrams - a table which contain the pieces cut for each sheet. Possibility to define types of materials (glass, wood, band) - for each material the user has a special table where it can introduce more information about the material. Automatic tool for computing the size of the pieces based on the external sizes of the product. Saves/loads results - All results can saved in txt files and loaded later. Load data from .xml, .dbt (specific files to version 4), .xls (Excel files) and .csv (comma separated) files). Data can be exported into very popular formats: Word, Excel, HTML, CSV (comma separated) and XML files. All panels and table's columns are resizable - You may customize the workspace. The new positions are automatically stored. Very fast running time - Solutions are obtained within seconds. Win32 native application. No dependencies required. Single file application. You can move a single file to a new computer and it will run without installation. Very efficient written. .exe has about 6 MB and the installation kit just over 1MB. Desktop application. You are in control of your data. You do not risk loosing data if some distant server fails. You can run the application without problems even if the internet is not working. 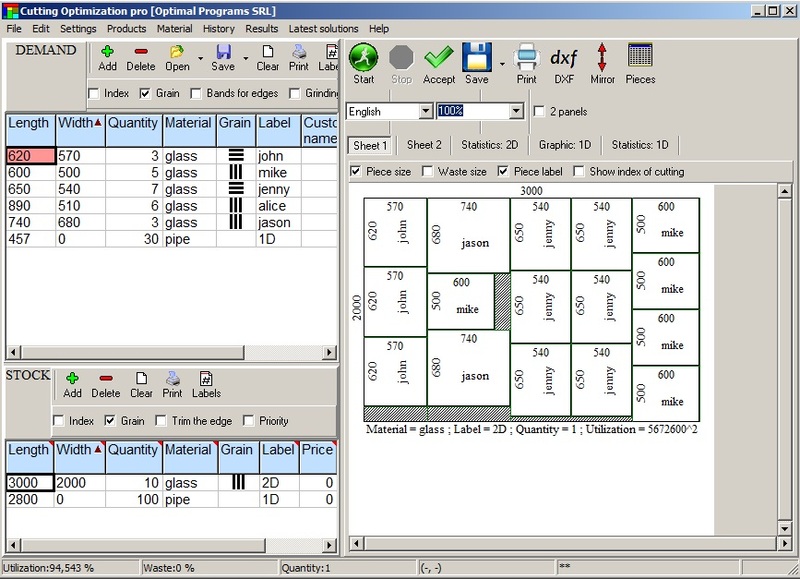 Pieces to be optimized are introduced in Parts table. Add data by pressing the + button at the top part of tables. Pieces to cut from (the sheets) are introduced in Stock table. The Stock is automatically handled. In the case of 1D optimization (pipes, bars, linear pieces) only the Length must be introduced. The other field (Width) must be left empty or set to 0. Press the button Start. At the end of cutting optimisation the solution will be printed in graphic and text mode. If you are not satisfied with the current solution (optimisation) you may press Start again. You may also increase the Optimization level from menu Settings | Algorithm. If you are satisfied with the current solution you may print and save it. Then press Accept. Utilized pieces will be removed and the useful one will be added tot the Stock. License is forever (for the purchased version). The software can be installed on a number of computers equal to the number of purchased licenses. Future, major versions, are not included in price. If the program is moved on a new computer, it must be deleted from the current computer. One license cannot be used by multiple users in the same time. Software is offered "as is". Please test it before purchase. We can provide support by email only. No support by phone, fax or on site is available. VERY IMPORTANT: If you dont receive an email from us in 24 hours it means that your server / provider blocks our email address. Please send us an email from a yahoo, gmail or hotmail address ! Want less features for less money? Try our Simple Cutting Software X. Want to optimize more complex shapes? Try our Next Nesting Software X. A list of features for each software is given here: Compare software. If you don't receive an answer from us in 24 hours it means that your email provider blocks our email address.! In this case please send us an email from an yahoo or gmail address !